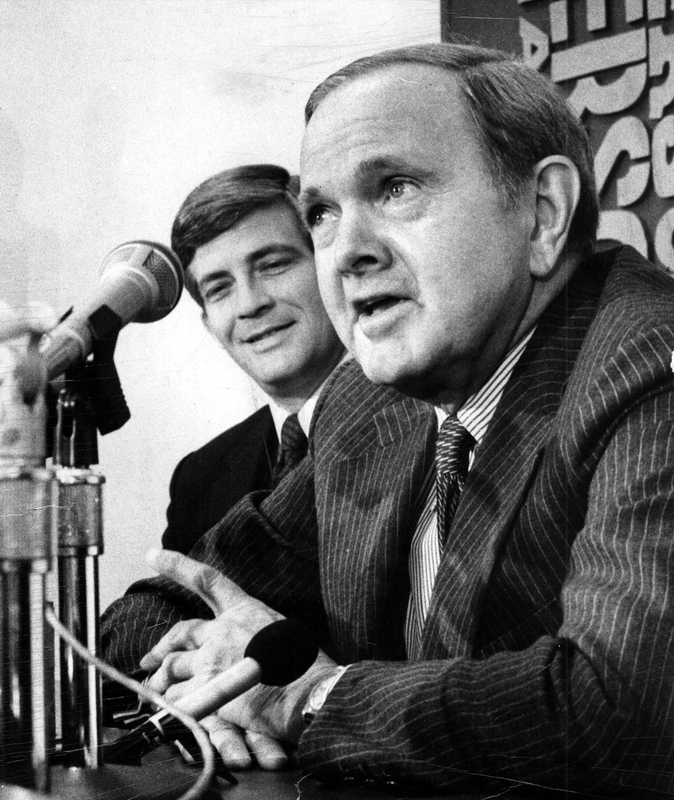 Ralph C. Wilson Jr. introduces Kay Stephenson as his head coach in a February 1983 news conference. The truth never hurts when good guys succeed and pompous egomaniacs do not because either combination removes the human element of sports. It’s easy to pull for good guys and against bad guys. What hurts sometimes is pushing aside personal sentiment and criticizing good people based on professional performance. It’s uncomfortable for anyone with a conscience. That was always my dilemma with Ralph Wilson. There was an inherent difficulty in separating Wilson the man from Wilson the owner, differentiating the husband, father and philanthropist from the distant businessman whose Bills missed the postseason more than two-thirds of the time under his rule. In the hours after he died Tuesday, everything people said about him was true. He was a good man, a loyal man. He cared deeply for his family and employees, from the quarterback to the people cleaning the parking lots. He was generous, a champion for numerous lesser-known causes that survived with his support. There is no discounting what he gave Buffalo. The Bills made the region relevant on a national scale, a fact only 31 other towns shared to the same degree. He fought hard for small markets and cared about people. He stayed true to his word and kept the Bills here until his death. Wilson deserved every ounce of credit he received for making it work in Buffalo, for Buffalo, for more than 50 years. But let’s not discount what Buffalo gave him. He turned a $25,000 investment into an $870 million fortune, which amounted to one whale of a score. Yes, he came up with the initial money. He helped the AFL survive. He was a voice of reason and helped with the merger. He understood the influence of television and the importance of making sacrifices for the greater good. But it also was for his greater good. He was able to capitalize more than most franchises when it came to revenue sharing. It meant you kept your team, but it was mostly on his terms when it came to revenues, stadium upgrades and tax breaks. He made a bundle from a community that didn’t have a bundle. Even the current lease comes with an escape clause after the seventh year. The deal soothed the fan base, but it also made financial sense for surviving members of his family and all but eliminated Wilson from ever getting blamed if the franchise moved out of town. It was good for you, certainly, but it also was good for him. He was a sweetheart of a man who thoroughly enjoyed a sweetheart deal. I’ve never viewed that as greed, as many others did. For me, he was like many wealthy people. They’re not hooked on money itself or what it provides them. Money is their way of keeping score. In professional sports, that doesn’t work for me. The franchise was turning some $30 million in profits in recent years, and in return fans were given teams that missed the playoffs 14 straight seasons. Wilson was known for his love of football, but his record made you wonder whether he loved winning football or the sport in general or the football business. And that was fine for people who supported the Bills, who supported him, if it meant bringing home a championship or even competing for the playoffs. The Bills had their chances over the years, but really it came down to one glorious era in which everything snapped into place. Take away the 1990s and the four Super Bowls, and the Bills made people question whether winning was a top priority. In fact, there were many seasons in which I wondered if winning was a priority at all. They made the playoffs 17 times in 54 seasons, only five times between 1970 and 1990, zero times since 1999. Winning became lost in the grand scheme. Its importance was beaten out of a fan base that for years lived under the threat of relocation. Fans came to rationalize that losing was acceptable so long as the Bills remained in Orchard Park. They came to appreciate the Sunday experience and ignore the Sunday goal. The standards were lowered. That didn’t make Wilson a bad person, not by any means. He was a great man who served his country and his community. He was brilliant in many ways. His quick wit was charming and clean and grandfatherly. But it will forever be difficult for me to agree that he was a “great” owner when too many examples showed otherwise. Over the years, numerous people have pleaded with me to see the bigger picture. Believe me, I tried. In many ways, I understood. I’m not qualified to examine his performance in the 1960s, but I remember the dreary days of the 1970s and ’80s. I covered the team to one degree or another when it turned around and more since the mid-1990s. Truth be told, many of the same people who praised him in death also criticized him in life over the past 25 years, usually with an apologetic tone. And that’s OK. Nobody takes joy in criticizing a person they admire, so they respected the truth while also showing respect for him. Looking back now, it was their dilemma, too.